This past week I done a 30 hour intensive crash course with Trevor, from start to finish he was amazing, helped me learn to drive basically from scratch. And I passed my driving test today first time! With only 2 minors!! Over the moon. Definitely recommend both the crash course, robbies, and Trevor! I have passed and I am over the moon. I had an amazing person as my instructor Alun who is very friendly and make me confident. He taught me exactly how Examiner Asks in the exam. Just passed my test first time after 3-4months of lessons with Colin. Would definitely recommend Colin if you’re thinking about lessons, will get you ready for your test and can have a laugh in the process. Can’t thank Ed Swann enough. He got my daughter through her test first time. She enjoyed the lessons and Ed did a great job of boosting her confidence. I used Robbies Driving School for a weeks Intensive Driving Course (30 hours). The Intensive course, are very intense and lots was learnt within the 6 hour lessons per day. My Insturctor Trevor was throrough and I managed to pass 1st time with only 6 minors. Thankyou to Robbies driving school! I’m about to buy my first car with confidence. I had an awesome time learning to drive in the UK with my instructor Alun. He gave very intuitive and easy to remember methods throughout the lesson. He was also very engaging and shared his personal experience with me. He was also relatively flexible with the schedule for lessons. He helped me pass first time after only 5 lessons. Amazing instructor! A biggest thank to Keith Brown. As a foreigner lives in Bristol, it took me a long time to pass the driving test. Keith never gave me up, always been there for me, and willing to go extra miles to direct me. He is an excellent instructor, very skillful and professional. Thank you very much Robbie’s and Keith. Hi Guys, After a really terrible and tough driving experience I almost gave up this because my first instructor (from a different company) was aggressive, rude, with an unacceptable behaviour, who tried to explain during of 14 hours how bad I am. After a month gap, I have decided to give one more chance for this and I can say I made a good decision. First of all I would like to give a big 5* to Robbies D School,because the management reacted well for my letter ,and they introduced me an instructor, who is a really easy going guy,very well handle nervous learner, and has a lot experience. Then Richard(5*): He was my instructor who made me calm at the first time, looked through what I have “learned” in these 14 hours before, and how to rebuild and build my skills to have a right knowledge, to complete my practical exam. I can say He is super professional never had an issue with him,and he is really look after you,to improve you onto the highest level what possible. Thanks for their professionalism, I have completed my Driving Licence practical exam, for first try. I wish all the best for them ,and for the future student as well. Drove with roccus through my lessons, he was my second instuctor and super easy to get allong with! Great instuctor patiant, fair and just a nice guy!! Passed today with 2 minors and needless to say all thanks to him!! Recomend him 100%! Top marks for Keith. Brilliant instructor who I’d recommend to anyone. Big thanks to both Keith and Robbie’s. All the best. Today, I passed my test first time and that is all thanks to Roccus, my amazing driving instructor. Roccus was patient with me throughout all of our lessons, from struggling to start off, to passing my test. I found Roccus to be very polite, calm in stressful situations and a great guy to have a conversation with! Overall, my experience with Roccus through Robbies has been amazing and I am looking forward to my life of safe driving! Thanks Roccus! AMAZING AMAZING AMAZING! I passed my test today and I would like to thank Roccus for helping me along my journey it has been a great pleasure having been taught by someone who has a great personality and unforgettable sense of humour, this is my first time passing with Roccus and after a year and a half of struggle and dedication I would like to highly recommend Roccus for anyone who is out there searching for a reliable and quality driving instructor!! – Thank you Roccus and stay safe on the road. I passed my driving test today and I would like to thank Kieth brown for his help and great teaching with out his help and believing in me after 2 years I would never think I would pass but now that I have I’m so grateful. I would highly recommend Kieth brown a great instructor and helped me pass with only 2 minors – Thank you very much Kieth and Drive safe. My instructor was Keith Brown and I just wanted to pass on my thanks to him. He has been a wonderful instructor. I was incredibly nervous to start driving, especially in Bristol, but Keith supplied me with the skills and confidence to do just that. I would recommend him to anyone thinking of starting driving lessons. Thanks Keith! I passed my driving test thanks to Ken’s great teaching and meticulous attention to detail. Appreciate all the help! A huge thanks to Darren for helping me get through my driving test and for giving the skills and knowledge. I’d highly recommend Trevor: a great instructor and he got me through the test, with only one minor, after only a week’s worth of tuition. I passed second time, my driving test on Monday 15th October 2018, two months before my theory test … inspired. From my bottom my heart, huge thank to Keith Brown who helped and stood with me for many years. I never thought I will drive a car in my life, because I was so scared to death, especially to drive a manual car, but with Keith helped, I enjoyed driving. you have been such a wonderful, patient and easy going instructor who always made me feel at ease and took lots of pressure off my driving. I sometimes, forgot that you were not my Psychology when i was feeling down or anxious from my personal problems, but you always listened . As we always had a laugh too. I am honestly grateful to Keith for all your help, support and encouragement working with someone who English is not her first language. Also, thanks for working hard to make me a confident and safe drive. I am gonna miss you! Huge thankyou to Keith Brown who was a great instructor. I managed to pass first time and I couldn’t have done it without him. Lovely guy and a brilliant instructor. Highly recommend him! A big Thank you to Simon Sumner who is a fantastic instructor, I couldn’t recommend him enough. He was very calm and patient with me and answered all my questions to help me understand what I was doing. I managed to pass first time which I could never have done without him. Thanks again! Massive thanks to Trevor who helped me pass my test with 1 minor after a 20 hour course! Couldn’t recommend enough. Thanks to Robbie’s and especially my driving instructor Harry I passed my test first time today after 3 weeks of lessons. Will definitely recommend to friends and family. I had two driving instructors before and didn’t get on very well. I then started my lessons with Rocco and I passed first time! I felt a lot more confident with Rocco as he had a sense of humour. It made me feel a lot less stressed compared to the other driving instructors I had previously, resulting to me passing my test first time. He explained in detail and always answered any questions that needed to be answered. I passed my driving test today with only 1 minor fault, after completing a 30 hour course. Couldn’t have done it with out my amazing instructor, Trevor. Very kind and attentive, he made me feel very comfortable and he had so much more knowledge than my previous instructor. He went into great depth with every aspect of my driving, couldn’t recommend Trevor, and Robbies highly enough. I had my first 2hr driving lesson friday 7th Sept,from 2:30pm – 4.30pm with Roccus. He instantly made me feel at ease as i was very nervous, his training techniques are very professional & his humorous quips really helped with the nerves! I would recommend Roccus to any 1st time learner driver, definitely 5 stars from me. I’ve had my introductory 4 hours with Roccus and i was extremely nervous to start with but he helped me an immense amount to calm down and focus. Extremely understanding and a very funny guy! Today I took my test at avonmouth and passed first time! I wouldnt of been able to pass without my fantastic instructor John Lewis. From day 1 put me at ease and has been amazing throughout. Thankyou so so much. My goal was to pass before I turned 30 and I have achieved that! Im so so happy! Keith was an excellent driving instructor who helped me through the difficult parts of driving and made me feel confident and comfortable on the road. He was very friendly and kept me calm when I was nervous. An excellent instructor who Id highly recommend! Thanks so much to Mark Emery, you are a brilliant instructor always made me feel at ease and took a lot of pressure off my driving! We always had a laugh too! Im gonna miss ya now Ive passed! Cant actually believe I did it first time! See you on the road! Passed my test first time today and it was all thanks to my driving instructor ken. he was so patient with me during the lessons that I wasn’t driving well in. He is also really nice and easy to get along with. I would definitely recommend as i wouldn’t of passed today if it wasn’t for his help. Huge thank you to Ken Burrows who helped me pass my driving test today! Could not have asked for a better instructor; he is kind, patient and very knowledgable! Would highly recommend him to anyone who wants to learn to drive of any age or experience. After having 2 previous instructors, I was very lucky to have Ken teach me and make me into a safe, confident driver! Thank you so much! Robbie’s have provided driving instructors for both my daughters. They were expertly taught to drive, and not just pass the test, which they both did first time. This time it was Hawkar Azizi who was the instructor and he was absolutely excellent in all regards. I am very grateful to him for teaching my daughter so well and for giving her the confidence, knowledge and skill that she needed. I would highly recommend Jaysen as a driving instructor. Very patient and great teacher. Easy to get along with, which made the atmosphere in the car relaxed. He really knows his stuff and took me around the test area extensively which really helped. Cheers Jay! Massive thank you to Wayne Shermon, couldn’t have asked for a better instructor! Although I felt nervous for my lessons Wayne helped build my confidence and was an excellent teacher. Couldn’t recommend enough. Huge thanks to Alen, he helped me big time and I am very greatful to have him my driving instructor,if you want to pass your driving test from the first time, Alen he is the right person for you, Alen you the star. Passed my test today! Robbies is an outstanding organisation to learn under. I had Keith Brown as my instructor and couldn’t ask for anyone better to have taught me. Very highly recommended for the best driving experience!! I passed second time with Richard Dolby after unsuccessfully learning to drive with four other instructors over the past seven years. I have been learning with Richard for not even five months and he absolutely changed my view of driving and boosted my confidence massively. I never thought I’d want to be on the road as I was a very anxious driver, but Richard really put me at ease and helped me to enjoy driving. When I explained to Robbie that I was a very anxious driver, he said he would pair me with the right person and he really did! Richard is a kind, funny and patient instructor and I am now on the road thanks to him and Robbie. Thank you so much! Massive thank you to Kieth for getting me a pass on my first attempt! Very lovely person and instructor, would highly recommend to learner drivers of any age. Had a couple trouble with the company but Kieth was always honest and helpful, couldn’t be more greatfull for everything! I want to say a huge THANK YOU to John Lewis for helping me pass my driving test with only 2 minors. When I started learning driving I was a bag of nerves and very low confidence. John has the patience of a saint. Gonna miss driving the hyundi and of course miss John too! You couldn’t ask for a nicer friendlier instructor to set you at ease. I can’t recommend Harry enough. I just passed my test after two previous failed with another school. Harry is funny and patient, but can be strict too. He definitely knows what he is doing and he wants YOU to pass. I am so so happy. Thank you Harry, you are the guy! I would like to say a big thank you to Steve Mitchell who helped me pass my test with only two minors!!! Couldn’t recommend him enough! Keith Brown was an amazing instructor and the calmest man on the planet, perfect for new wannabe drivers. Made Passing very smooth for me thanks a lot! Thank you so much Robbie for assisting with my sons intensive course. Great instructor Martin Bowell !! Take his time explains clearly and is patient thanks so much!! Trevor has been an amazing instructor, helping build my confidence and reassured me the whole way through my lessons. I did an 30 hour intensive course with him and passed my test first time with only 8 minors! Wouldn’t of been able to do it without him! Highly recommend choosing him to take your lessons with! A massive thank you to Keith Brown – He’s kind, patient and constructive with all his feedback to really help build confidence and knowledge behind the wheel. He’s amazing at what he does and has been with me every step of the way and I couldn’t have asked for a nicer instructor to help me learn to drive. Would recommend him to others in a heartbeat. Thanks again Keith! A thankyou to Simon Sumner. He allowed me to feel confident which helped me pass first time. Highly recommended, thanks again. Alun Paget was a brilliant instructor. Gave me the confidence and skills needed to pass my test first time! Thank you Alun Paget for being an incredible instructor. Always willing to answer any questions and preparing me for the worst. I would definitely recommend him to anyone. Cheers Alun! Keith Brown – One of the nicest and most helpful driving instructors out there! He is very patient even if you’re a slow learner like myself, gives very helpful constructive criticism as well as compliments! Would definitely recommend Keith as your instructor. I would like to say a massive thank you to Sagar! I never thought I was going to pass my driving test after three instructors and very little confidence behind the wheel but was able to pass 1st time thanks to Sagar.. he was always patient with me, very calm and a good laugh which really helped calm my nerves. If I made mistake he just got me to try again until I was able to do it right. Thank you Sagar for always believing I could do it! Could not have asked for a better instructor! I would like to give Mark Emery a big thank you for getting me through my driving test. I have had my provisional for about 30 years and have been learning on and offf. Mark was very professional (even the sheep jokes) and put me at ease and really made me believe that I could do this. Huge thanks to Chris Mills great instructor couldnt ask for anyone better very easy to get along with and is very paitent and teaches you the best way brilliant instructor highely recomeneded. Would like to give a big thanks to Chris Mills for helping me pass. His humour and patience got me through our lessons. Would highly recommend him and anyone learning with him will truly appreciate his knowledge and stories! Yesterday I passed my test first attempt all thanks to my instructor Richard Hornsby who had lots of patience dealing with me. He teaches an applicable framework within which to drive safely in any car. Can’t stress how much I recommend him. Huge thanks to Keith Brown for teaching me to drive and as a result, helping me pass first time. He has been a very friendly, comforting and understanding instructor that has really helped me gain the skills and confidence I’ve needed to help me drive safely on my own. Once again a huge thankyou, I couldn’t have asked for a better instructor! I would like to say a massive thank you to Chris Mills. He was very patient, always on time and always gave very clear advice. He gave me a lot of confidence in my ability and provided very clear instructions on maneuvers. I would recommend him to anyone and as a result of his excellent teaching I passed first time. Steve Mitchel was a wonderful driving instructor, who taught me the skills I needed throughout my learning experience. I would recommend Steve to absolutely everyone, as he was so kind and patient with me when I made silly mistakes, Steve was reassuring when teaching me. Learning to drive was something I really wanted to do, and I am so pleased I had Steve to teach me such an important skill. Even when I wanted to give up after failing the second time, Steve stuck by my side and made it happen, explaining how important it is not to give up on something we have both worked so hard for. Once again thank you so much. Huge thanks to Andy Thompson for helping me pass my driving test recently. Having had several instructors over the years (I’m 34), and become increasingly anxious about driving, I’d started to wonder whether it would be possible. But Andy is a very calm, patient and understanding instructor and helped me gain much-needed confidence in my driving abilities. Very much appreciated! Alun Paget you wonderful wonderful man! Thank you very much for all the help and having all the patience in the world to teach me how to drive finally. Couldn’t have done it without you. A big thank Q to my driving instructor Benn Roberts who helpled alot to get through my driving test with just 3 minor faults. Throughout my lessons he was very professional,spotted my weak areas and provided valuable suggestions for improvements.I would higly recommend Benn Roberts for anyone who is looking for friendly and goal oriented approach. A massive Thank you to my driving instructor John Lewis for helping me to pass the test the first time. He was very patient, always on time and planned every lesson. Would recommend John to anyone who wants to start driving. Thanks again John. Big thank you to Colin Vennall, a great driving instructor who has always been calm, patient and helpful – can’t stop cracking jokes and makes it good fun. He taught me quickly and really well – helped me pass first time! I’d like to thank Colin Vennall, I highly recommend him as he is an amazing instructor. He cares about his students passing not just the money and was always patient and calm during the lessons, as a result I passed first time. Thanks again. Thank you to Colin Vennel for teaching me how to drive and passing me first time! An amazing bloke who is a very calming presence in the car and loves a good dad joke. I will miss our lessons very much because we had way too much fun. I passed my test with Alun. Great instructor and great jokes, it’s gonna be tough driving around without that welsh accent pointing out all the mistakes I make… Thanks Alun! I recently passed my test with John Lewis, great instructor, very positive and patient!!! I definitely would recommend him to anyone. Thanks John. Massive thank you to Keith Brown for getting me through my lessons and enabling me to pass my test, really good instructor and would recommend him to anyone looking to drive. A massive thank you to Wayne Shermon, who helped me pass my test today with 2 minors. He is a really great instructor and was very patient and calm throughout my learning. His instructions hugely simplified the maneuvers, and he went out of his way to print off maps to help me visualise roundabouts I had difficulty with. I was able to make really quick progress with his teaching style. Would 100% recommend Wayne at Robbies!! After having a few lessons with a large UK driving school where my instructor didn’t deal with my anxiety well at all, I began learning with Keith Brown who has been amazing! I’d 100% recommend him to anyone. He’s super honest and reliable, and helped me gain the confidence pass my test even though I’m the most nervous person ever! Over the moon thank you Keith!!!! Cant thank mark emery enough for having patience with me on the road! And passed first time! Cannot recommend mark enough! Thankyou!! John Lewis is such a great instructor and I passed the test on my first attempt with him. He was very patient with me and I would recommend him to anyone! Thank you so much John! Huge Thankyou to Mark Emery for being an excellent driving instructor! I would recommend to anyone learning to drive. Passed my test first time! Thanks Mark for all your help and support. I recently passed the test on my first attempt with John Lewis. John was very patient with me. He answered all of my questions with just the right amount of detail I required. John had a genuine interest in seeing me pass, so he focused on the key areas I was having difficulties with instead of wasting time on things I understood well. In the end, on test day, there wasn’t a single part of the test route I hadn’t seen before, which made things easy for me.Thankyou for everything John! Was learning to Drive with Chris Mills i was able to learn all of the steps of how to drive and doing manoeuvres easily. He is very patient and had a good sense of humour i would definitely recommend anyone to learn with Chris in the future. Huge thank you to Alun for helping me to pass first time. He is a brilliant instructor who was very patient and has a great sense of humour. I would definitely recommend him to anyone! Been learning to drive with Mary Dobson, she’s amazing. Seeing my progress grow is great, she taught me everything I need to know and I’ve booked my test. She has been very patient with me as I haven’t got much confidence and she’s made me such a confident driver. Huge thank you to Mary! Highly recommend! Keith Brown was a great instructor, he was able to teach me how to do manoeuvres using different simple steps to complete the manoeuvre, he also had little tips to make driving and manoeuvres easier. He also has a great sense of humour and is just a nice guy in general, I couldn’t recommend him more. Couldn’t thank Grahame Woodberry enough for helping me overcome my fears and nerves to pass my test. Thanks a lot for giving up your Saturday, and occasionally Sunday mornings and doing your upmost to support me. I’m pretty confident in my driving skills as I learned from the best! Great instructor and a great driving school. Would like to say a huge thanks to Alun for being a funny and patient instructor who helped me to pass my driving test for the first time! Could not recommend him enough to anyone as he has a great sense of humour and bizarre but brilliant ways of remembering manoeuvre techniques which really worked for me. Thanks very much Alun for your excellent teaching.t be the driver i am now without your help would highly reccomend.nk you. Thank you Wayne Sherman for getting me through my driving test wouldnt be the driver i am now without your help would highly reccomend.nk you. Well I must say, I first started my lessons with another driving school and what a waste of time and money it was, for 9 months I was paying an instructor and all he done was sat in the car playing a fidget spinner and blue tac he gave no instructions or showed me any manoeuvres I failed my test twice because of this. I then contacted Robbies and Ben Robberts was my new instructor 5 weeks of lessons and I passed. Highly recommend and a great driving school. Thank you to Rob Hopkins for getting me through my test. Very patient and reliable. Thank you. I’d like to say a MASSIVE thank you to Keith Brown for helping me pass my test (with no minors) brilliant instructor, very patient, especially with me as I was nervous due to 10 year break in lessons. Can’t recommend him enough. Thank you Keith :)see you on the road. Thank you so much to Harry! Did a 30 hour intensive course with him and passed first time with 6 minors. The guy is an absolute legend and I knew from the beginning I was in safe hands! Recommend HIGHLY. If, like I was, you’re unsure of which of the many Bristol-based driving schools to use, then I couldn’t recommend Robbie’s enough. Alun Paget was my instructor and I really believe he was the reason why I passed first time – it was a great mix of hands on driving (I had done a couple of hours before, so Alun made sure that I didn’t have to repeat myself), brilliant demonstrations and explanations and a really good laugh. Alun really had a way of demonstrating ideas so that anyone (even me!) could understand it intuitively, and he was really patient at times where even I didn’t know what I was doing. So once again, please do drive with Robbie’s, I’m sure all the instructors are fantastic, and to Alun, thank you for everything you’ve done and I’ll see you on the roads! After a 30 hour intensive course, I have passed today with no minors! A big thank you to Trevor for his excellent teaching! A BIG thank you to Trevor. I completed a 20 hour intensive course over the course of a week and passed first time with only 2 minors. I had driving lessons many years ago but was never very confident on the roads and had some bad experiences with driving teachers in the past. Trevor took the time to understand my current driving skills and knowledge and made sure I was comfortable with the basics as well as the fine details needed for the test. As well as being very knowledgeable about the area and a fantastic teacher, Trevor is a really great guy! Thanks very much Trevor! A big thanks to Alun for helping me pass first time! I wouldn’t have passed if it wasn’t for his ‘try again’ method. Alun was amazing and I would recommend him to anyone  Thanks Alun! Harry was a fantastic instructor and he’s helped me feel confident when driving by myself after having passed my test with only two minors. I’d highly recommend Harry, he has a very high pass rate and he’ll make sure you’re ready for your test. Thank you Harry! A massive thankyou to Keith Brown for helping me pass my driving test first time! He’s an amazing driving instructor who was able to give me the knowledge and confidence to even put in for my test! Thankyou Keith. A massive thank you to Alun Paget! 4 years ago I failed the test several times with a number of driving instructors. Alun was able to spot and resolve issues with my driving, using effective teaching techniques, and ultimately considerably boost my confidence on the road. For the first time I went in for the test feeling confident – and I passed! THANK YOU ALUN I REALLY MEAN IT! Huge thanks to Alun for helping me to pass my test first time. A very good driving instructor wth an excellent approach to teaching how to drive correctly and develop habits that will stay with you as you carry on driving independently. Also provided some amusing chat along the way. Highly recommend. Huge thanks to Alun! I was able to pass after 3 months of lessons! Don’t let the accent fool you, he’s friendly yet professional and sometimes (sometimes) even funny. Full of memorable techniques that stick in your head during the Driving practical and beyond helpful at every stage of progression to help you improve. Was also flexible around my working hours to fit in lessons when required. I passed my driving test yesterday with only 2 minors thanks to Ed Swann and his patience. I didn’t think I’d ever have the confidence to even book my test after having two previous instructors who were rubbish. Ed was always encouraging me and never put me down. Thank you!!!! Massive thanks to Keith Brown on helping me to pass my driving test first time! He’s been a great teacher and helped me through everything. Thanks again! I would like to say thanks to John I passed my driving test 1st time. 28TH March. John made sure I was full prepared for the test so when I went in all I had to do was drive like I was in my lessons it was simple. I passed my driving test first time on 15/03/17 at Kingswood test centre after 7 months of lessons with Stephen Michell, brilliant teacher and support throughout, very pleased with my lessons and the successful outcome. I would like to say a Big Thankyou,. To Keith Brown of Robbies Driving School. I have at last finally Pass My Driving Test on Friday 17th March 2017 & I think he’s is a brilliant Driving Instructor. I would recommend him to anyone.!!! I would like to say thank you to Stephen Mitchell for being the best driving instructor, stayed patient with me throughout all of my lessons and helped me feel confident and at ease. Passed my test on the 9/3/17 wouldn’t of been able to do it without his help. After passing my test abroad and driving on the wrong side of the road for 6 months, Alun Paget had the unenviable job of preparing me for my UK test. As a previous instructor himself, his knowledge of the road and test was outstanding and more than a match for my many questions! His easy conversational teaching style prepared me for anything the test and indeed future driving has had to throw at me. Thanks to him I passed my UK test first time, after one month of fitting in lessons around work. So, while we maybe shouldn’t create a religion in his honour (and he might like that…), I would highly recommend investing in lessons with Alun. You will not be disappointed. Massive Thankyou from me to Robbies driving school! So happy to have passed my test first time with only one minor! 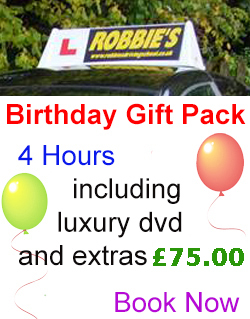 Robbie is a great instructor who makes learning how to drive very easy and enjoyable. A huge thank you to Trevor Hammacott for helping me pass my driving test in a week! I did an intensive course with Trevor (30 hours – novice) and passed my test exactly a week after my first lesson with only a few minors having not driven in 9 years! Trevor is so understanding and a fantastic instructor – he makes you feel immediately at ease behind the wheel. I was terrified of taking my test and convinced I wouldn’t be ready in a week but Trevor got me through – the man deserves an award! Cann’t recommend Trevor and Robbie’s highly enough! Just want to say a huge thanks to Colin. Great instructor with a great teaching style. Very recommended. Thank you! I would like to say a MASSIVE THANK YOU to my driving instructor Suzanne!! She was patient, kind & supportive. Passed 1st time! I would recommend her to anyone wanting to learn! A huge thank you to Alun Paget, one of the most hard-working, funny people I have ever met and, the most fantastic instructor. After having another instructor I have witnessed first-hand how great he is and I would recommend him to anyone! Thanks so much Alun, you’ve been fantastic. The biggest thank you to Alun Paget for his nagging, amusing anecdotes and amazing teaching. I passed first time today and couldn’t have done it without him! I will miss our evenings together and will always hear your catchphrases in my head when driving! Definitely recommend Alun and Robbies to anyone looking for a reputable instructor. They will make you work hard, take you from a nervous wreck to confident and you’ll even enjoy it by the end! A massive thank you to Alun Paget. Very professional but at the same time very witty. I learnt so much and enjoyed every lesson I’ve had with him. Alun is always ready to help and will always try his best to free up some time for his clients. I couldn’t recommend him enough. Alun if you’re reading this, thank you! I wanted to say a massive thanks to Paul Johnston for helping me pass first time. Certainly knows exactly what he is doing, would recommend! Huge thank you to Colin on helping my pass today! He has an amazing layout of lessons which worked really well and I got on with him straight away. Only had 1 minor on my driving test! Colin gives you help when you need it and gives you the confidence to drive independently as well as being able to have a laugh. I would highly recommend him to anyone. Thank you to Colin and to Robbies! Super massive thank you to Mike Thatcher for being such a brilliant, hilarious and friendly driving instructor! He made my driving experience enjoyable rather than stressful, and gave me the confidence and skills to pass my test with only 2 minors. Thank you Mike! Would like to say a massive thank you to Ken for being an amazing driving instructor! He’s helped me pass my test first time today. I highly recommend him as he encourages you to be well and makes the lessons enjoyable. Thank you Ken and to Robbies! I wanted to say thank you to Trevor for his guidance and assisting myself to pass my driving test. Trevor understood my needs and I couldn’t have asked for a better instructor. Only 2 minors and I have the confidence to drive on the road and I recommend with Trevor and Robbies to anyone who is starting to learn or wanting to pass their test. Would deffo recommend Alun Paget! Very good instructor that makes you feel at ease, passed first time after doing lessons once a week for around 4ish months! Many thanks. An enormous thank you to KEITH BROWN!! An incredible teacher with a LOT of patience who got me through the nerves and helped me pass my test (much to my astonishment). I would recommend Keith again and again as an instructor. Thank you! A huge thanks to Alun Paget for his instruction, support and brilliant approach, and succeeding in getting my daughter through her test yesterday with flying colours! I cannot recommend him enough – his approach is excellent and his manner is spot on – very firm and realistic but also with kindness and a touch of humour when needed! Have already recommended him and will continue to do so. Thank you to Steve Mitchell for all the help in getting me to pass my test. Great to feel so comfortable in a car with an instructor who is so outgoing and calm with you! No matter failing my test twice before, it’s great that he stays positive and encourages you throughout; would recommend him for driving lessons. Thank you Steven and to Robbies! I just wanna say a massive thank you to Steve Mitchell!! I’ve been learning to drive since July and Steve has always been so calm and patient. He such a good teacher and I couldn’t have asked for a better instructor. I would recommended him and Robbie’s to anyone. I passed my test first time today and I wouldn’t have been able to do it with out steves help!! Thanks so much again! Keith, amazing driving instructor, thanks so much for helping me pass, he has so much patients and always helped me stay calm when I was struggling. Really friendly and reliable, would definitely recommend! Rachel Johnstone, an absolute diamond! I’ve been learning on and off for a few years and never found an instructor suitable for me. Rachel is calm, professional and inspires confidence in each and everyone one of our lessons. I can not recommend her enough. Oh yeah, and I passed, that was good too. Ken,amazing driving instructor thank you very much for all the support during my journey to be able to drive. You have been incredibly parcent with me,I really appreciate everything. would like to say a massive thank you to Alun Paget for teaching me how to drive, not only did i pass first time, but he made the experience easy and enjoyable!! highly recommend this driving school, and definitely Alun as your instructor. A massive thank you to Keith for encourage me and being passionate, passed first time which I couldn’t believe. I’d just like to say thank you to my driving instructor Graham for his help and guidance which enabled me to pass my driving test first time with only a few minors. Very much appreciated. I want to give a massive thanks to my driving instructor Ken. I passed first time with only three minors thanks to Ken. Ken made the lessons very enjoyable and he is also a very funny instructor and I would highly recommend him as a driving instructor. Ken has an amazing pass rate and the lessons with him are relaxed and he’s really easy to get on with. If you want a great instructor then Ken’s your man. A big thanks to my driving instructor Harry. Within 2 months, his instruction and approach of getting stuck right in got me to such a standard that during the test I felt certain and confident, meaning I passed with only a few minors! 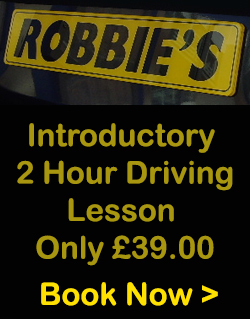 I recommend Robbies driving scool, and Harry in particular, if you want to develop real driving confidence. Massive thanks to Steve Mitchell who got me test ready so quickly and passed my test 1st time, massive thanks, would highly recommend, top bloke! Massive thankyou to my instructor Trevor. had a 1 hour assessment lesson ready to book myself an intensive course and was recommended 30 hours which turned out to be perfect. 20 wouldn’t have been enough and 40 would have been too much. Started my driving Tuesday the 11th of October and passed my test Tuesday 18th October. Couldn’t ask for much more. Trevor is a good instructor who was clear and precise and got me from virtually unable to drive to passing in a week. The crash course is a little bit tiring but blasting out the hours in a short period of time was clearly beneficial (at least for me). Would recommend both Trevor and Robbies. My instructor Keith deserves a medal for teaching me how to drive. He quickly adapted to my learning style, understood how my dyslexia will affect my driving and how to help me change that. I would defiantly recommend him to family and friends. Once again, thanks Keith and thanks Robbie’s!!! My instructor Steve Mitchell was an absolute joy! It was lovely to feel at ease and comfortable in a car with someone for two hours! He offered not only support but a sense of friendship and kindness. Steve kept me motivated and encouraged me to continue driving despite previously failing twice already! I would highly recommend Steve to my friends and family who are learning to drive! Thank you Steve and thank you Robbies. My driving instructor Keith was amazing. He really understood my learning style quickly and I was able to pass within six months of starting. I really recommend him and don’t think I could of done it without him. Thanks Keith. Huge thanks to John who taught me in the automatic. Had 3 instructors over 10 years with other driving schools but John managed to help me pass within 6 months!! Could not have wished for a better instructor. He wasn’t just a ‘teacher’, his advice and most of all support, helped me get through! Just cannot express enough thanks! Big thanks to Steve Mitchell, after switching to him from another instructor he helped me pass first time. Brilliant instructor, definitely kept me cool with my nerves and would definitely recommend him to everyone. Couldn’t have done it without him! Thanks Steve! There’s not enough words to recommend Alun Paget. There is no doubt that his support, knowledge and unique metaphors allowed me to pass my test not only quicker but easier and with a lot less stress. I’m actually going to miss my lessons as they became enjoyable as much as they were educational. You couldn’t wish for a better tutor. Just wanted to say what a fantastic instructor Trevor is! His teaching style is ideal for passing tests, especially for me after failing a few previously, and he performed a miracle by helping me to pass! So if anyone is after a great instructor, Trevor is highly recommended! I passed first time with Stephen Mitchell, amazing teacher. Would definitely recommend him, lovely man and doesn’t moan if you go wrong. Best teacher ever. Steve Mitchell managed to pass me and put up with me, top man! A huge thank you to Steve Mitchel, who was an incredible driving instructor! I passed my driving test first time with him and every lesson leading up to it was great. I highly recommend Steve. I took just over 20 hours with my instructor Graham,from April to July and I passed my test first time yesterday. I would like to thank Graham for his persistence, hard work and continual faith in me as I wouldn’t have been able to do it without him. A massive thank you to Chris Parker for helping me build my confidence on the road as well as my skills! Always has a great time, and managed to pass my test first time! Had great fun all the time! Would definitely recommend Chris to anyone! Massive thank you to John Lewis. Put off learning to drive for 15 years and never thought i could. The moment i got in the car John made me feel at ease and made the whole experience a joy. If John can help me pass my test…first time and only 3 minors may i add lol.. then he can teach anyone. I cannot recommend him enough. Thank you Ed Swan, I passed my test first time today, with only 2 minors. Great instructor for a nervous 17 year old. Always reliable and prompt. Highly recommend. My sonjust had 3 days of driving tuition with Mark Thatcher, 20 hours of lessons (he had driven some 2 years previous) and passed his test the next day. He said Mark was a fantastic teacher, calm, informative and thorough and made the whole experience as stress free as could be. I really recommend him! I passed my test first time with only 2 minors thanks to the amazing Keith Brown!!! 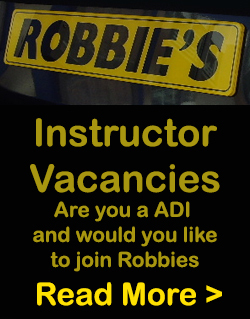 After struggling with another driving school I changed to Robbie’s and Keith made all the difference in the world! With easy and well-targetted instructions, it doesn’t get any better than Keith! I am so thankful and would recommend him 300% as he is very patient and supportive. Thanks again! Would like to say a huge thanks to Ken Burrows who got me passed first time with 1 minor in just over 3 months! Honestly couldn’t recommend a better instructor, he was calm and helpful through everything we did and just generally makes you feel comfortable and confident! Highly recommend Robbies as a driving school and thanks again Ken for putting up with me through some very interesting lessons haha! Thank you to Keith Brown for helping me to pass my test first time. He is an extremely good teacher, very patient, calm and supportive. I would highly recommend him to anyone. Thank you to Ken for putting up with all my nerves and worrying! I passed first time with only 3 minors and couldn’t have done it without all the help and support I received. Would like to say a massive Thank You to Colin Vennall for being an amazing driving instructor, he gave me great encouragement and got me ready for my test before I ever thought I would be! I couldn’t of done it without him! I now recommend Robbies and Colin especially to anyone I know who’s learning to drive!!! Thank You!!!! I changed my driving instructor after a few hours and asked for Keith Brown as he also taught my sister. He was really nice and made sure to teach me how to correct my wrongs when I made a mistake. I passed my test first time and it was great to have Keith’s support throughout my learning. Passed my test this morning 1st time! Thanks to Trevor at Robbie’s Driving School, a great Instructor who got me test ready in 10 hours. Would highly recommend. Thank you Wayne Shermon for helping me to pass my test! From my first lesson Wayne was a calm and effective teacher, and I couldn’t have passed so quickly without him. Thank you! I would like to thank my driving instructor Ken Burrows who has been extremely patient with me over the last couple of months and has helped me pass first time at the kingswood test centre today. I would definitely recommend him to anyone learning to drive he is extremely calm and great to learn with. Cheers for all the help Ken and thank you Robbies for putting me in touch with him. Big thank you to Harry Jordan who couldn’t have prepared me better for passing my test first time. Really appreciate all the support, advice and most of all patience. Thanks again! I have been learning with Alun Paget for the last 3 months and today have passed. Alun was great at making me feel relaxed when driving, as well as showing and telling me where I was going wrong. Great service. Highly recommend both the school and Alun! message=I recently did an intensive course with Trevor and I can emphatically say he is a fantastic instructor. If you want an instructor that will get you yest ready in a short space of time he is your man! I am so grateful to Alun Paget who prepared me for my driving test in quite short period of time and helped me to pass my test first time with just 2 minors. He really is a very good instructor! An enormous thanks to Alun Paget, who helped me pass my test in a very compact timescale! mistakes independently. Thanks very much to Alun and to Robbie’s! Huge thanks to Steve Mitchell who helped me pass my test today with only 1 minor. Super instructor, calm and patient, and more faith in my abilities than I had in myself! Thank you again Steve, couldn’t have done it without you!!! I took my lessons woth Robbie’s driving school.My instructor was Richard Hornsby.I am really thankful for his patience and continuous support that he showed throughout mylessons.The tips to rectify any error while doing maneuvers come so handy when you take your actual test.I am really glad that I got the right instructor as it is the core requirement to pass your test.I would definitely recommend Robbie’s driving school to anyone who wants to do a confident driving.Thankyou Richard once again! I passed my driving test first time today  Couldn’t have done it without my wonderful instructor Bob Lapham, I’m actually going to miss having lessons with him. I won’t hesitate to recommend Robbie’s Driving School! Would like to thank JOHN LEWIS for being a fantastic support and getting me through my practical test first time!!!! I highly recommend him as an instructor and can’t thank him enough for his consistency, flexibility and patience! Thank you Keith for putting up with me over the period of my lessons. I don’t think I would have passed first time if it wasn’t for him! Keith Brown is the best instructor anybody could ask for. I just passed my test with only 1 minor and I couldn’t have done it without him. I will miss my lessons with him and I will definitely recommend him to everyone. I have driving lessons with Chris Hanney, such a great instructor and really got me believing I could drive and to a high standard. His methods are really great, easy to understand and his patience is unbelievable. He also has a great sense of humour which takes away any nerves. Highly recommend. Can’t believe I’m finally driving and it’s all thanks to Ken. He’s an amazing instructor. Started driving with a different instructor and never thought I’d get there. Change and went with Ken and passed! Awesome  calm, understanding and flexible what more do you need. Passed first time today thanks to Steve Mitchell  Excellent instructor and would recommended to anyone! Big thanks to my instructor Richard Evans, who taught me a lot of helpful tips and techniques, and offered great advice. passed first time thanks too Ken burrows! Brilliant instructor!!! I’ve had 4 lessons with Chris hanney and today on my 4th one I drove all the way to longwell green and keynsham. I would of never of thought on my first lesson id possibly be driving all that way on my 4th as I was extremely nervous and unconfident on my 1st. Chris is a fab instructer and has boosted my confidence and ability massively! I cannot wait for my next one! As someone who was quite anxious prior to starting my lessons, Keith has made the process a lot easier. He is very patient, reliable and knowledgeable. I certainly feel much more confident in my driving ability now. I passed on my first attempt on Thursday this week. Mike Thatcher was my instructor, very patient, accommodating, great at explaining things. Highly recommended. Cheers! Big thank you to Keith Brown so far in my lessons. I feel completely at ease each lesson as he is a calm, well mannered and punctual instructor. With his help I will be sure to pass in no time!  Thanks Keith! Thank you very much to Ken Burrows who is an incredibly patient and calm instructor. He is pragmatic and flexible which is especially good for a slightly older learner. Very pleased to have passed and would highly recommend. I would recommend Keith Brown as a driving instructor as I thought he was a very good teacher. He is very patient, understanding and made me feel at ease when driving. He made time and effort to get to know me as an individual which helped build a good relationship. He was extremely reliable and punctual. Anyone wanting to learn how to drive… he’s the man! Thanks to Ken Burrows for helping me pass my test. I would highly recommend him as he explains everything really well and makes driving easier and more comfortable. A big thank you to Alun Paget. He’s an excellent instructor. He explains everything in a simple way, and makes a driving lesson a lot more enjoyable with his sense of humour! Thanks very much Alun. I passed first time thanks to Keith Brown. He is an excellent teacher, patient, and explains everything simply. Thank you Keith. Can’t thank Steve Mitchell enough, brilliant teacher who was calm and patient with me, passed first time with 3 minors, highly recommend him! I cannot recommend Alun Paget enough!! Passed today with confidence. He is very patience and guides you very well through all the manoeuvres. Very flexible and was able to fit me in when I needed! He also makes you feel very comfortable as he has a lot of humour!!  thanks Alun !!! I’d like to say a huge thanks to Colin Vennall who was an excellent teacher! Was feeling nervous about driving again after a number of years being off the road, and he made me feel very comfortable – so friendly and full of fun!. Also passed first time in Bristol, so thank you Colin! Passed with only 1 minor thanks to Steve Mitchell, a fantastic teacher and a great guy as well. He made learning easy and I highly recommend him. Thank you! appreciated as well! Looking forward to a few motorway lessons with him as well  thanks again Chris  ! Passed first time today after having approx. 10 lessons with Alun Paget! A very patient instructor and was very helpful, getting me familiar with test routes early on and confident with all the manoeuvres! Thank you Robbie’s and Alun! I passed my test after having John teach me to drive an automatic. He is a great instructor, and I cant recommend him highly enough. Thanks John,without you I would still be getting the bus. Kieth has been a very good instructor, helping me with all my stuggles and helping me pass my test first time! He was always on time and was always polite and helpful, i would defiantly recommend Kieth. Passed first time at southmead today. I highly recommend Dan Cook,hes a great instructor and very supportive. Thanks Dan / Robbies. I passed today first time with only 4 minors, thanks to Steve Mitchell: ) Very patient, makes the lesson fun and interesting whilst teaching you the correct techniques you need : D He believed in me and encouraged me when my confidence was down, because of this, I am looking forward to driving independently! Thanks so much Steve, see you on the road! I’d like to thank Andy Thompson, he’s been a brilliant and very patient teacher, helped me work out all the kinks in my driving. Managed to pass my test first time. I’d recommend him to anyone. I passed first time, i would defiantly recommend Gerald and Robbie’s. Very happy with how it went! Massive thanks to Steve Mitchell for helping me pass first time with only 3 minors! Patient and calm teacher and a true gent. Thanks again Steve! I’d like to thank Steve Mitchell for helping me pass! After a long year I have finally passed. Steve is very patient and excellent to learn from with many tips and tricks. Cheers Steve. Would definitely recommend Robbies driving school! Thanks to Trevor’s intensive lessons passed theory and practical first time around! Passed today with just 4 minors. Keith is a very patient and easy going instructor with structured lessons. Highly recommended. I would highly recommend Ken, very calm and friendly. Really good with nervous drivers and he’s always been very patient with me, I don’t think he’ll miss my singing in the car.  THANK YOU!!!!! I passed first time with Dan in only 20 weeks. Would definitely recommend. Passed first time thanks to Gerald Dardis, couldn’t recommend him enough, patient, supportive and tells you what you need to do, straight to the point. Thanks again! Really recommend Dan Cook, I passed first time with him. He’s a great instructor and really patient! I would like to thank Dan Cook for helping me pass my theory and practical in a Month and half. Coming to him I had no driving experience, I then went on to passing first time. I would highly recommend his services and thank him and Robbie’s again. I wouldn’t suggest anyone else but Alan Pagett. The guy knows driving on a different level. If you are willing to learn how to drive properly and learn the right techniques with simple step by step actions, go with him!! I’ve just had two sets of two hour lessons with Alun. I can’t recommend him enough. It was my first ever time sitting in the driver’s seat, and I didn’t even know where to put the key in (! ), but he put me at ease and was very patient with me. Great chap, lots of laughs. I was happy nattering away and driving after the first 15 minutes. He definitely makes driving a fun experience for me, and tailors lessons to where he thinks your weaknesses are, can’t wait for my next lesson. Thanks Alun! Changed driving schools to Robbie’s three months ago and had Mark Emery, he helped me pass today with five minors! I’m so grateful, thank you! Mark is the best! Had my first lesson in 18 years with Alun Paget yesterday …I was petrified ! However ,Alun put me at ease straight away and gave me the confidence to start driving straight away ! Great start I’m so much more confident already . Thanks and hope it continues ! Dan Cook is a brilliant instructor, I passed first time without too many lessons. He’s very calm and collected and makes you feel very comfortable behind the wheel. Many thanks to Ken – Passed with 3 minors. Ken was flexible with timings and patient throughout. Highly recommended. Passed today 1st time with Jenka Poole as my instructor. Very calm and patient instructor who made me feel at ease even when I was at my most nervous today. Also very friendly and caring and she understands what you’re going through. I would highly recommend Jenka to anyone who wants to learn to drive. She has not only been my driving instructor but she has also been a great friend to me. Thank you so much. I’ve just passed my test within 10months of driving with Jenka Poole. Great teacher helped me understand things so quickly and was patient and calm throughout. The best instructor you could ask for. Always helping and always friendly. So I would recommend her to everyone I know. Passed today 1st time at 40yrs old with only 2minors!!!! Would not have passed without the Amazing ,amazing teacher Steve Mitchell. He been patient, understanding , makes you believe u can do it, and all with a sense of humour! Passed my test first time on the weekend. Would absolutely recommend my instructor Colin Vennall. He made me feel safe and taught me to drive in a fun and easy way. To anyone who is worried about driving find Colin. A great instructor who is patient and easy going, with lots of fun tricks to learn to drive properly.